Tomorrow. Tomorrow is Christmas Eve. Tomorrow’s tomorrow is Christmas. Today is Christmas Eve’s Eve. But, wait. Am I even allowed to say “Christmas”? Would it be more politically correct, more considerate to say, “Holiday’s Eve”? After all, how do I know if you (my reader) celebrate Christmas? What if you don’t? Am I being rude? As a kid, I don’t remember there being much fuss around Christmas. I mean, sure, there were presents and Santas and snowmen and trees. But controversy? Arguments? Boycotts? The same is true there for Ramadan and Diwali and Hanukkah and Passover and Chinese New Year and a host of other religious and cultural holidays. There, they’re seen for what they are: celebrations, remembrances, family, humanity. Holidays are a celebration of life around the planet. Is that so hard to understand? And so the next time I hear a news story about the Christmas Debate, I think I might scream. Or cry. Or, at the very least, sigh. A genuine “Merry Christmas!” isn’t religious imperialism, folks. It’s love. It’s that time of year again. Time to deck the halls, sing Fa-la-la-la-la, and rush to the stores for those oh-so-amazing deals on Black Friday. I don’t go shopping on Black Friday, but, if I did, it would remind me of shopping in Hong Kong. Hong Kong malls are crashing-into-strangers crowded all the time. In fact, almost everywhere in Hong Kong is crowded all the time. When I moved home, and the streets emptied out by 9 p.m., I felt like I was living in a ghost town. Where were all the people? People talk about reverse culture shock. It’s real, they say. But, unless you’ve experienced it, no one really believes it. This is your home! they think. How can ‘home’ be something you have to get used to? This is especially true if, since you’ve been gone, everything at home has changed. I don’t usually talk about personal things on this blog, but, two months after I arrived in Taiwan, I found out my parents were getting divorced. Over the course of the next few months, everything I’d ever known was turned upside down. My parents sold the house I grew up in, my stuff was boxed up and placed in my dad’s small apartment, and our family dynamics were changed for forever. Nothing would ever be the same. For an idealist raised on the idea that divorce is (almost) never okay, this was a tough pill to swallow. I recognized many of the reasons behind the divorce, but I still fought back tears every time I thought about my family. And now, with new people coming into my parents’ lives, there’s a whole new prospect of becoming a stepdaughter and stepsister. It’s enough to inspire an identity crisis. But, oh yes, I got off track. It’s “that time of year” again, and suddenly I can relate to articles about holiday depression I wrote for work a few years ago. 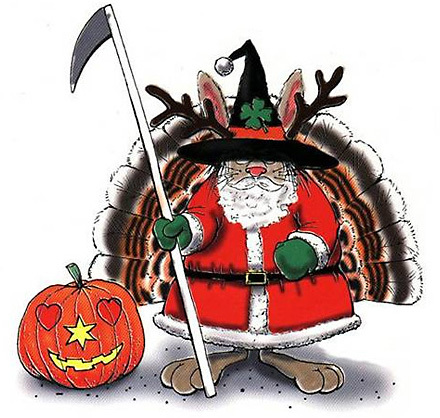 Here in the States, we build up Thanksgiving and Christmas to be such a joyous time of year. But what if your holidays don’t live up to their name? Sometimes the holidays are something to survive, not enjoy. But, no matter what, they are always a time to be looking outside of yourself. I may be having a rough holiday season, but who isn’t? Maybe money is tight for you this year. Maybe Grandpa just died. Whatever it is that is holding you down, I’d encourage you to look for ways to make the holiday season bright by doing something for someone else. Maybe it’s a shoebox filled with toys or a donation to the Salvation Army. Maybe it’s a letter to Grandma or a surprise dinner for Dad. Whatever it is, if it is heartfelt and has nothing to do with you, I guarantee it will leave with more joy than any gift Santa is going to bring you this year.